Nuri Sahin and Co. could only take a point from today's match in Nürnberg (Photo: nordphoto). You could see the disappointment in the players at the final whistle. 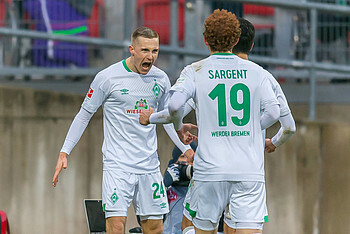 “It feels like a defeat today,” said Niklas Moisander just after the final whistle as Werder conceded a late equaliser in their 1-1 draw against Nürnberg. The Green-Whites took the lead through Johannes Eggestein but were unable to secure a victory away from home. “I’m not satisfied with our performance today. We didn’t have any movement off the ball, poor positional play, no tempo and were not comfortable in position,” explained Florian Kohfeldt after the match. Here is the post match reaction to the match in Nürnberg. Johannes Eggestein opened the scoring (Photo: nordphoto). Florian Kohfeldt: "We certainly wanted to win and show that we have gone one step further following the Hinrunde. However, we played poorly in the first half and didn't show any composure in possession. I'm not satisfied with today's performance." Max Kruse: "If we're totally honest, we didn't deserve to win today. We are really disappointed. We didn't approach the battles correctly and allowed ourselves to lose focus." Johannes Eggestein: "We are all really disappointed. Ahead of the match, we said we wanted to play well and we lacked our cutting edge for most of the match."